Ever since txtr unveiled their disappointing new ereader last week I've been wondering what it looked like in the hands of real users. Txtr's own demo video was staged, and so were all the product shots, so it was hard for me to grasp what it really looked like in the hands of a user. Yesterday I found a video on Youtube which shows the beagle. I actually found 5 or 6, but this was the best. As you can see, this isn't exactly a svelte ereader. According to the press release it measures 140mm tall and 105mm wide. That's only slightly smaller than the basic Kindle, which measures 165mm by 114mm (an inch taller, basically). This ereader is being marketed not to users but to telecoms. It's expected to be bundled into cell contracts and used as a smartphone companion. As such, it was designed to be a very limited ereader with no cables, card slot or Wifi which can only hold 5 ebooks at a time. 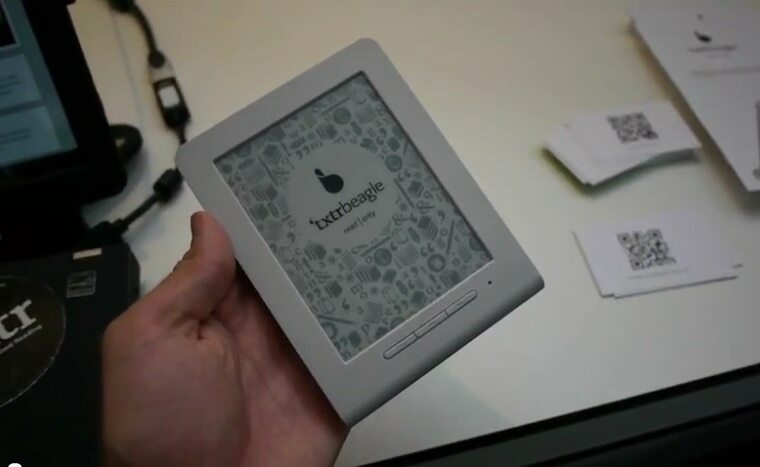 Instead of showing text, the Beagle actually displays page images which were formatted by the companion app running on the partnered smartphone before the ebook was transferred to the Beagle via Bluetooth. Amazon to Open a Kindle Store in Brazil in November? The press release calls it an ereader. I guess they backed off after I criticized the Beagle last week. This is a fallacy based on the bespoke mindset. Back when a particular technology is so expensive and touchy that you can only afford one instance it makes sense to buy the best you can afford. When the technology gets cheap and easy enough you can buy several instances ranging from cheap to moderately expensive. My favorite example is watches. In 1960 owning only a Rolex made perfect sense. Now most people have a nice Casio and a few Timex watches, using the latter when theft or damage is an issue. But in this case headphones are a better example. Most people have a very nice pair of Bose or Sennheiser headphones a few cheap ~$20 headphones or ear buds and innumerable dirt cheap earpods which come with every thing with a headphone port you buy. As a result you stuff a cheap pair of earbuds in every bag you own. I’d argue that the equilibrium is in eReading is going the same way. If you are reading under perfect conditions you use a nice tablet, but if you are out and about you grab your Nook Simple Touch or equivalent Kindle or Kobo. In this situation the txtr is the equivalent of the cheap earbuds, they come with the phone and are cheap and small enough to carry anywhere. Except the Beagle is neither cheap or small, much less convenient. The equivalent of the blister-pack earbuds or drugstore calculator isn’t here yet. Those products only arrive after a market is fully mature and stratified with clear high, mid-range, and entry-level products. This hasn’t happened yet; we still have companies trying to define what they think an ereader is supposed to be and trying to send stripped-down entry level readers at mid-range or premium prices. The Beagle is just not a good consumer product. It *might* be a good institutional product as a component in turnkey Library systems. But that’s not how they were billing it at the book fair launch. They were billing it as an ebook reader. Which it isn’t. It can only pass as an ebok reader if the customer has never actually read an ebook on a PC or cellphone, much less a dedicated device. When all the buzz about your product is about what it isn”t and what it can’t do, you have a problem. Again, I cite the PALM FOLEO. I think tablets have reached the equivalent of blister-pack earbuds. All those $99 ereaders from earlier this year certainly have the feel of a cheap but adequate product. There have even been a few LCD based ereaders which almost made it to this point, though those devices were mostly crap. eBook readers are nowhere near that mix, are they? Agreed with fjtorres. With how much attention they got, though, I wonder if other companies might announce apparently insane deals with a big asterisk. (That is, the way you need to get a cell phone plan). I wonder though, whether other companies might want to try similar deals. Like Amazon or B&N selling an ereader for $30 with a phone contract (B&N has connections with MS, which really wants to sell their phones, and Amazon IIRC is already selling phones and plans). Or B&N selling an ereader for $20 with two years of their store membership plan.